If you’ve been reading AK for a while, you know that my Grandma is one special lady. And she’s feisty too! A few weeks ago my mom informed me that my Grandma had been in a car accident and the driver drove off after hitting her. Good news is that she was okay but unfortunately her car had a few thousand dollars worth of damage. But this is where the story gets good: Instead of reporting the hit and run to the police, she got back in her car and chased him down so she could get his information. As in, she literally cut him off the road so that she could get his insurance info. By the way, she’s 82 years old. I told you she was feisty. And so sharing that story and this soup together makes the most sense, because it’s both fiery and comforting at the same time (kind of like Gloria). My Grandma shared his recipe with me a year ago, and I made a few changes to adapt for where I live and what’s available this time of year. Typically she makes it with fresh cubes pumpkin and Hatch green Chile. I didn’t have either of those things, so I opted to use butternut squash and canned green chile. Don’t worry though, it’s still delicious and perfect when you are trying to cure a cold. It does have a hint of spice, so I recommend using mild green chiles. I hope you love this soup. Best served with saltine crackers and a smile. P.S. thanks grandma for the recipe inspiration. I love you! I hope you love this recipe as much as I do. If you make it, be sure to let me know by tagging #ambitiouskitchen on Instagram. 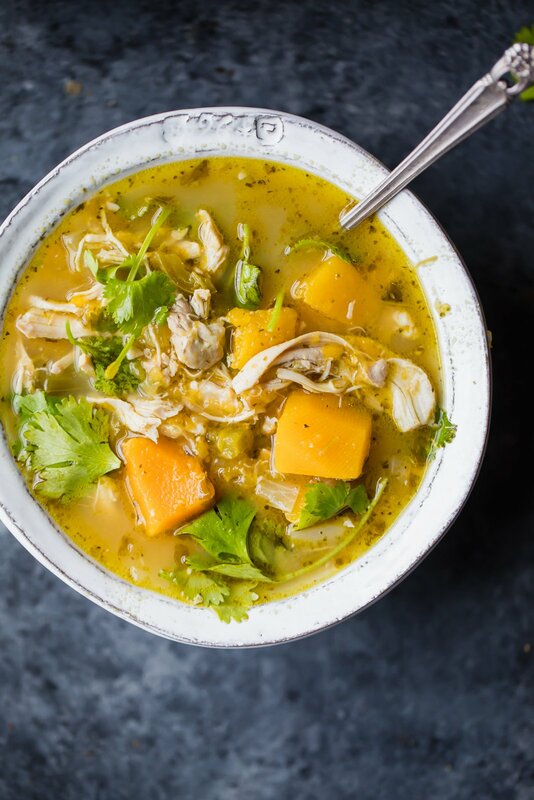 Flavorful, protein-packed chicken soup made with butternut squash and green chile! This comforting dish comes together in one pot and is perfect for a cold night. Place a large dutch oven or pot over medium high heat and add in oil. Once oil is hot, add in garlic, onion, green pepper and cilantro; cook for a few minutes until onion becomes translucent. Next immediately add in your green chiles, butternut squash, cumin and oregano. Saute for a few more minute to let the spices cook a bit, then add in chicken broth, chicken thighs, corn, salt and pepper and lime juice. Bring soup to a boil, then cover, reduce heat to low and simmer for 20-30 minutes until chicken is fully cooked and no longer pink. Once chicken is cooked, remove with a slotted spoon and transfer to a cutting board to shred with two forks. Add chicken back to pot, taste and adjust seasonings if necessary. Serves 4. If you want to make this soup a little more hearty, I think 1/2 cup uncooked quinoa would be delicious. Just add it when you add the chicken/corn/broth in. Feel free to leave the corn out to keep this soup paleo. 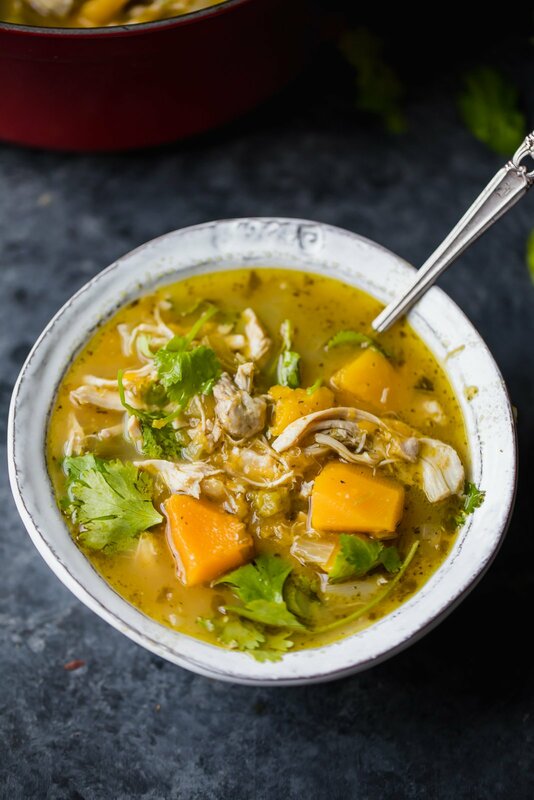 68 Responses to "Butternut Squash Green Chile Chicken Soup"
How do you print this recipe?? I had the same question. I don’t see a PRINT button. Hilight only the ingredient list then copy and paste in your email “compose” program, send to yourself and then use the print button when you open the email. With your mouse, block the recipe to just below “Total time” and include the photo. You will see a pink rectangle below “Total time”–it is the print button. For some reason, the word “Print” and the rectangle otherwise don’t show. Anyway, I was able to print it. This looks so tasty! 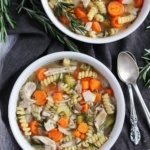 Can you use bone broth in place of chicken broth for this recipe? It’s one of my favs! I haven’t tried using bone broth, but I think it should work just fine! This soup looks great, but the story about Gloria made me crack up. That is great. I’m so glad 🙂 Enjoy!! Your grandmother sounds just like my great-aunt. She might be 86, but that didn’t stop her from cutting down a tree on her property this past summer. Haha good for her! That is amazing. This looks so good i love Paleo diet. Thank you so much for sharing this. I found this Paelo diet and it’s amazing how variety of the food they have. I just made this recipe X 3…..It is very delicious. I did add a little Better than Bouillion because I realized I used unsalted broth. 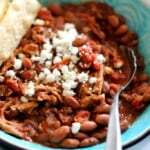 Great recipe-this will be a cold weather staple at our home. Love your stuff!!!! Amazing!! Yes – this one is perfect for the colder weather. Enjoy! Thanks for a delicious recipe! I was getting so bored of my go-to stop recipes! This was fun, and bright and easy – perfect to get me through this cold snap. I used frozen corn instead of canned, and added it with the lime juice right at the end of cooking to retain freshness. The quinoa was an excellent addition! Loved the slight crunch and texture it gave to the recipe. I’ll definitely be making this one again! This soup is a great one for getting out of a cooking rut – I’m so glad you enjoyed it! I finally made this today and it’s a winner. Of course I couldn’t find the squash so I used sweet potatoes and I put in a jalapeno instead of the green chilis. I just threw everything in my instant pot and used the stew button. took a fork to the chicken right in the pot since it was already falling apart. Delicious and perfect for the bitter cold weather we are having. Thanks!! Loved the story too. Perfect! I’m glad this worked well in your instant pot 🙂 Enjoy! 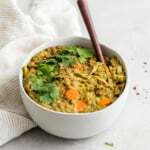 I was wondering if this worked in the instant pot! Would you mind telling me exactly how you used it? Really just put all the ingredients in at once and hit stew? I am new to the instant pot, but I am eager to learn its secrets 🙂 Thank you so very much! Could you sub in chicken breasts instead of thighs? Would there be any cook time difference? Yes! It should be the same. Enjoy! If you want to make this whole30 can you eliminate or substitute the corn for something else? Can’t wait to try this! At what point would I add quinoa? You can add it when you add the chicken, corn & broth! Someone in my Whole30 group shared this, and it looks delicious. I’m going to try it this weekend (without the corn, to stay Whole30 compliant) – needing more healthy but comforting recipes for this cold weather! Gloria is the best! And amazing – I hope you love this one! I’ve pinned this to try soon! My boyfriend is “allergic” to cilantro, but this seems to have enough flavor without it. Complete side note…I love those white bowls! Where did you get them? Absolutely wonderful! Thanks for sharing this recipe! If I’m going to make this in the crockpot, should I just add everything at once like you suggested for the Instant Pot? Just made this soup and it turned out amazing! Right when I went to add the cumin, I realized I was out, so I swapped for curry powder. Also, I don’t like cilantro, so I used parsley instead, adding only at the end when shredding the chicken. Very tasty recipe, one that I will definitely make again! Monique, do you think this would freeze well? Perfect! Glad those swaps worked out 🙂 And yes I think this should freeze just fine! Corn is a grain, and is thus (sadly) not Paleo legal. 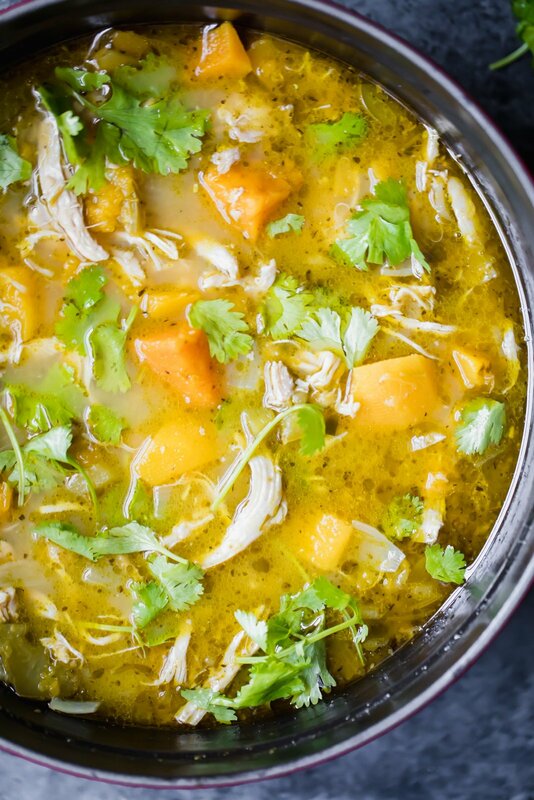 This soup looks delish, but it should not be listed under your Paleo recipes. Sorry! I’ve added a note – easy to leave it out 🙂 Thank you! I can’t pin this recipe. I keep getting an error that says the site doesn’t allow pins … but I don’t want to lose this recipe. It sound so damn yummy!!! We’re working on a fix for this tech glitch as we speak – apologies for the inconvenience! This was really good. I used chicken breasts and added quinoa and a little more salt an it was great. Makes so much soup too! Perfect! Yes, love meal prepping this one for the week. This soup is really good. The only change I made was using chicken breast because it is what I had. Really yummy!!! Perfect! Glad you liked it! So good! I added 1/2 cup quinoa, and smoked my cubed squash & corn. I even got my “meat & potato guys” to eat it and like it! This one is a keeper! Loved this one! Shared and several friends made and loved this week too. Right up our alley, flavorful, spicy and healthy! Thanks! Made this yesterday to stock my freezer with some easy, healthy lunches. It came together so easily, and it’s delicious! I think the squash and chicken are enough to make it pretty hearty, but I might add some quinoa or rice if I’m having an extra hungry day. The spice is pretty mild, but I like that it’s something I could offer to anyone in my family. I might kick ia serving up a bit with some Tapatio. Definitely would make again. Just made this tonight, SO good! I added some extra chicken and served with tortilla chips (Cause that makes sense to me). Will add this to my dinner rotation more! Amazing! Love the idea of tortilla chips with this (totally going to do that next time). I’ve loved a lot of your recipes, but this one may be my favorite!! I made a few changes: I roasted the butternut squash, pepper, and onion with smoked olive oil, cumin, chili powder, garlic powder, and smoked paprika and used hatch chili salsa instead of green chilis. I added the veggies much later into the cooking process, since they were already softened. Thank you so much for posting this! I made this tonight and it was absolutely delicious! Just what we needed on a cold winter night. I added some Tuscan kale to give it a bit more greens and am very happy with how it turned out. Thank you!! So glad you loved it! Kale sounds perfect in here, too. This looks so good and I love that you have videos now! I remember reading your blog all the time in college and making those turkey meatballs of yours, yum. You’re a veteran AK fan!! Love that. And glad you’re liking the videos! Hi Monique! This is my second time making this recipe and it is truly delicious! My husband and 11 year old son love it 🙂 Thank you for sharing! Hi Christy! So happy to hear that 🙂 thanks for your comment!